Dark Age of Greece research papers discuss the events that took place from 1150 to 700 B.C. and the Homeric Period of Ancient Greece and Greek culture. The “Dark Age” of ancient Greece lasted from about 1150 to 700 B. C. It is known as the “Dark Age” not so much for being an era of “cultural decline as for the archaeological obscurity” of it. There is not much archaeological remains to give histories or archaeologists an idea of what life was like during these centuries of ancient Greece. From the little that can be learned from archaeological discoveries and the Homeric poems of the period, it is evident that it the “splendid Mycenaean civilization” which had existed in Greece came to an end. The reasons for this are not known, however. The Dark Age, particularly its early centuries, was a period of instability and warfare throughout Greece and between Greece and its Asian American neighbors. All of the fine arts practiced in Mycenaean Greece were lost. 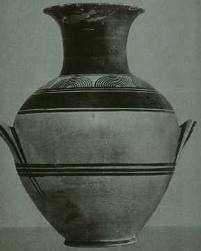 For instance, the pottery of the years from about 1125 to 1050 B. C. is called Submycenaean for its sharp contrast with the: skilled and handsome pottery of the Mycenaean period. Submycenaean pottery has been called a “style of exhaustion.” The potters did not try anything new, but simply replicated shapes and decorations handed down form their parents and grandparents. Their clay was usually poorly prepared. But besides the obvious stagnation in the arts, the population of Greece “dropped precipitously.” In the region known as Attica, the number of settlements went down by fifty percent. The drastic reduction in population and settlements is attributed to migrations, violence, and invasions. Use of Cosmetics by Women in Ancient Greece - Use of Cosmetics by Women in Ancient Greece was one of the various ways women altered their appearance but, with a less permanent result. American Folk Art - American Folk Art research papers examine the folk art that is produced in cultural isolation by artists or artisans. Cynics - Cynics research papers examine the ancient school of philosophy in Greece and Rome who practiced cynicism, in which the purpose of life was to live in agreement with nature and follow virtue. The Peloponnesian War - The Peloponnesian War research papers show the Peloponnesian War Era as a sad chapter in the glory that was the golden age of Greece. Mycene versus Minoan Civilizations research papers compare and contrast the two civilizations. The Minoan Culture of Crete was able to last for centuries because of its strong economic basis in trade both locally in the Adriatic and far from its own Minoan Civilization. Ancient Civilizations research papers examine when humans started making permanent settlements which brought on the agricultural revolution. Paper Masters writes custom research papers on Dark Age of Greece and discuss the events that took place from 1150 to 700 B.C. and the Homeric Period of Ancient Greece and Greek culture.